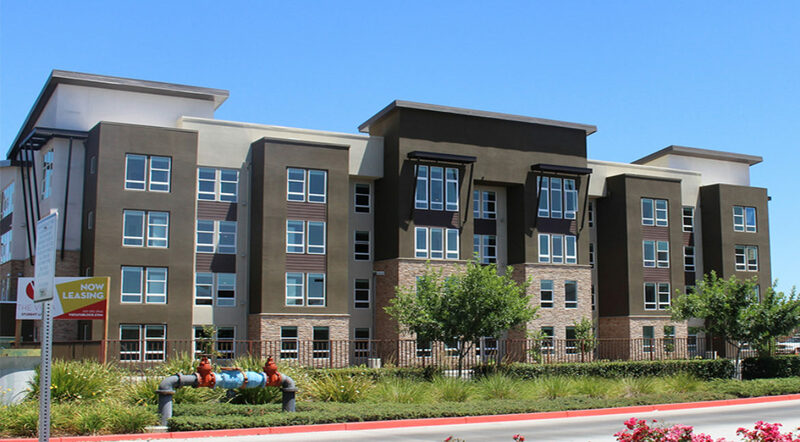 Agoura Hills, CA—AMCAL Equities, LLC announced today (June 25, 2018) that its newest student housing community, The Vista in Turlock, California, has been awarded LEED Silver certification. The LEED (Leadership in Energy and Environmental Design) rating system, developed by the U.S. Green Building Council (USGBC), is the foremost program for buildings, homes and communities that are designed, constructed, maintained and operated for improved environmental and human health performance. The eco-friendly, LEED silver designed property, which opened in summer 2017, is a purpose-built student residential complex with 660 beds/180 units located at 900 W. Monte Vista Ave., Turlock, CA 95382, is directly across the street from the California State University, Stanislaus (CSUS) campus. The Vista is situated on three parcels totaling approximately 9.7 acres with three four-story buildings including a 6,460-square-foot fully-loaded club house that features outside volleyball and basketball courts, and a resort-style swimming pool. The Vista project received a 6 out of 6 rating in the alternative transportation – public transportation access category for its proximity to public transportation ensuring ease of commuter access, and achieved high ratings in other categories including development density and community connectivity and alternative transportation – low-emitting and fuel-efficient vehicles. Projects pursuing LEED certification earn points across several categories, including energy use and air quality. Based on the number of points achieved, a project then earns one of the four LEED rating levels: Certified, Silver, Gold or Platinum. AMCAL has earned LEED status for several of its projects including five Platinum, eight Gold, four Silver (including The Vista), and three Green Point certifications. AMCAL has built to LEED Silver certification since 2007, well ahead of industry adoption. In addition to The Vista, AMCAL is set to open two new student-programmed communities near CSU campuses in Chico and Sacramento this summer, and is currently constructing a 260 unit/1,039 bed off-campus student housing project located on a 1.5-acre site within one block of San Jose State University (SJSU) in San Jose, California, to be completed in 2020. About AMCAL Equities, LLC Founded in 1978, the AMCAL group of companies is one of the nation’s leading housing development companies, developing quality rental and ownership residential properties throughout California and Texas, including affordable housing, luxury apartment housing and student housing. AMCAL has developed more than $1.5 billion in multifamily housing and market-rate apartment projects consisting of more than 6,500 units. The value of AMCAL developments currently under construction exceeds $1 billion. AMCAL is headquartered in Agoura Hills, CA and maintains offices in Orange County, and West Los Angeles, California, and Dallas, Texas. For more information on AMCAL, please visit: https://amcalhousing.com.